These moreish dumplings – also known as pampushki – are served as street food in Ukraine, Bulgaria and Russia. 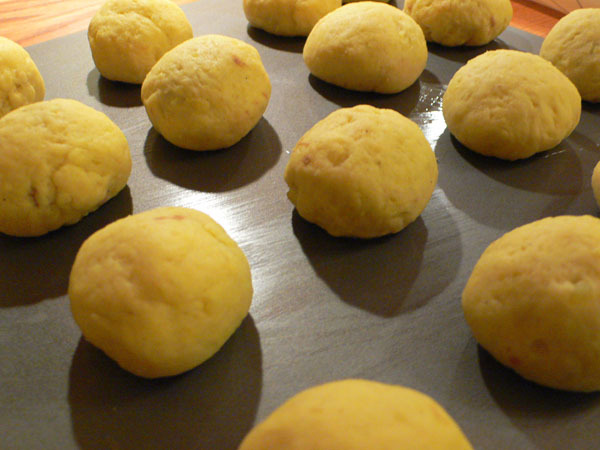 They are usually sweet and made with a yeast dough – rather like doughnuts – but this sweet-savoury version is made from potatoes and is homely and hearty. Serves 4. 1. Coarsely grate the potatoes in a food processor. 2. Place in a colander, press down with the palm of your hand, and squeeze out as much liquid as you can. 3. Put the grated potatoes in a large bowl, and mix well with the mashed potatoes and a little seasoning. 4. Make the filling by combining cheese, cherries, sugar, lemon rind, dill if using, and seasoning. 5. Grease your palm with a little oil, and place a dollop of the potato mixture, spreading it slightly. Put a teaspoon of the cheese and cherry mixture in the middle of the potato round and fold over the edges. The dumplings should be sealed properly, otherwise the filling will leak out, making a mess. 6. Repeat the process until you have used up all of the potato and cheese mixtures. Place the finished dumplings on a tray and cover with a damp tea towel while you are working so that they don’t dry out. 7. Heat the oil, and when very hot, deep-fry the dumplings until they are lightly golden brown. 8. Serve hot as a snack with jams or preserves.